Nowadays you can get fantastic prices for “designer” wedding dresses online…or so it seems. What is the real story behind these sites that offer these amazing deals and send your dream dress straight to your home? Let me tell you: It is too good to be true! A dress by Maggie Sottero that costs £2000 in a store doesn’t cost £300 online. It is simply not possible. The problem is that brides get tricked in to buying these dresses because these sites often look very professional as they display the pictures of the actual designer’s dress. I will give you 8 ways in which you can protect yourself from buying a fake dress and how to recognize the difference. 1) Use common sense. There can be a price difference between different stores but it won’t never be hundreds of pounds. 2) Check the website of the brand of the dress you like. The shop in which you want to buy the dress at should be listed on their dealers page. 3) An authentic dress always has the label of the brand stitched inside of the dress. It is like regular fashion in that way. 4) The delivery time of most wedding dresses is 4 to 5 months. If a website can deliver a dress in several weeks then there could be a problem. There are almost no wedding dress brands that can deliver a dress this fast unless they are delivering from stock. 5) Check these websites carefully, often the spelling is bad or you are not able to get in touch with them. Do they have a contact page? An about us page? Is the spelling correct in the article description? These are all ways to identify a fake dress website. 6) Find reviews about these stores online. If they have a lot of unhappy customers then it will be easy to find something about it online. Type in the name of the site into Google and see what you can find. 7) Check out the website of the real brand. 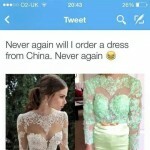 Often you can find a list with stores that illegally use their pictures for selling fake dresses. 8) Recognizing a fake dress when it gets to you is the easy part. They often look nothing like the real thing. You will find very thin materials, no volume in the skirt, cheap applications or sequin rather than Swarovski stones. Obviously it can be a real disappointment and in the worst case scenario by this time it will be too late to buy the real version of the same dress. Don’t do this to yourself! Ask the store if it is possible to buy the sample dress with a discount. Certainly around summertime shops are willing to get rid of the old stock since new dresses will arrive from September on. Maybe they are willing to sell you the sample dress. Ask if the shop has a yearly sample sale. Does the retailer hire gowns? We do! This can help to dramatically stretch the budget for your gown.